A high strength fibre already used in protective apparel has won an award for its latest application - hurricane-resistant curtains..
Spectra, the high-strength fibre developed by Honeywell, is the base material for special storm-resistant curtains that have just won a US safety award. Known as Storm-A-Rest, the curtains have been named top innovation in home technology by Popular Science magazine. The fibre enables the Storm-A-Rest curtains to protect windows and doors during hurricanes as they can withstand 155 mph winds and impact from large wind-borne projectiles (Fig. 1). They are manufactured by North Carolina-based JHRG. Storm-A-Rest curtains are approved under Florida's building code for Wind Zone 4, which includes the area within one mile of the state's nearly 1200-mile coastline. It is estimated that 7.3 million homes are within the hurricane zone. According to Honeywell, homeowners can easily install the curtains using standard fasteners without special tools. 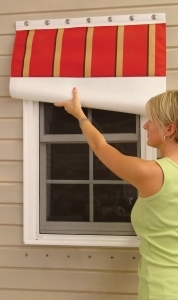 They can be fastened to wood, brick or concrete surfaces. The curtains are available in more than 350 Sunbrella-brand accent patterns and come with a five-year warranty. Unlike alternatives like plywood and corrugated aluminium panels, Storm-A-Rest panels are easy to install, maintain and store. Because the curtain incorporates Honeywell's Spectra fibre, they are extremely lightweight, weighing less than two ounces per square foot - about 75 per cent less than corrugated aluminium panels. Pound for pound, Spectra fibre is 15 times stronger than steel. It is made from ultra-high molecular weight polyethylene using a patented gel-spinning process. The fibre exhibits high resistance to chemicals, water, and ultraviolet light. Honeywell also says it has excellent vibration damping, flex fatigue and internal fibre-friction characteristics. It also has up to 60 percent greater specific strength than aramid fibre. The fibre is used in numerous high-performance applications, including police and military ballistic-resistant vests, helmets and armoured vehicles, as well as sailcloth, fishing lines, marine cordage, lifting slings, and cut-resistant gloves and apparel. Honeywell also converts Spectra fibre into the Spectra Shield family of specialty composites for armour and other applications. In fact, the company has just expanded its line of Spectra Shield II ballistic material for body and vehicle armour. The new offering, called Spectra Shield II SR-3130, incorporates a proprietary resin system that provides added rigidity. At the same time, it delivers the same high level of ballistic performance as other Spectra Shield II materials that Honeywell introduced in 2007. Spectra Shield technology is a patented Honeywell process designed to optimise the ballistic performance characteristics of Spectra fibre. Existing Spectra Shield II products have been widely adopted and proven for the most advanced armour applications globally, from bullet-resistant vests, breastplates, and helmets to combat vehicles and military aircraft - where lightweight solutions and durability are critical. This latest Spectra fibre-based material, like Honeywell's existing products, is transparent to radar.